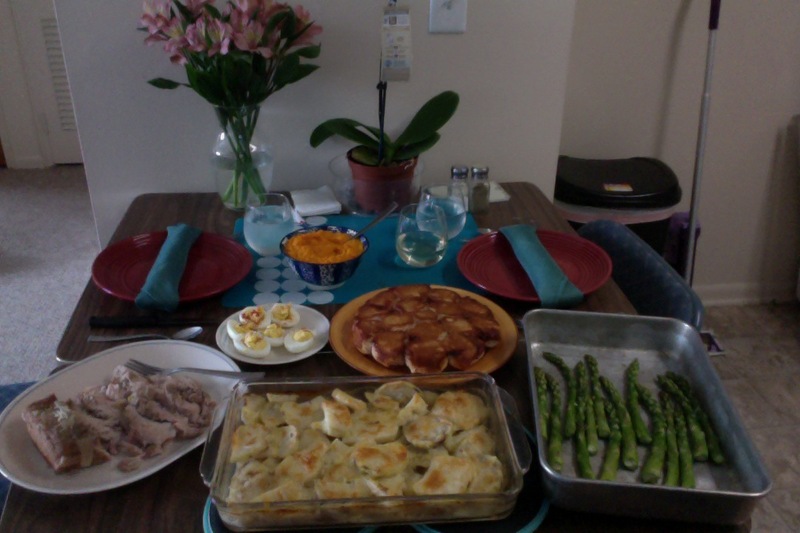 We made the tastiest Easter feast food ever. Fo’ realz. Here’s how to make a whole bunch of tasty foods. This is a classic recipe my mom makes for Easter dinner every year (and sometimes just when we’re craving some carroty-gingery goodness). Peel and chop up the carrots into 1-inch pieces, boil them in a pot until they’re well-cooked. Puree in a blender with all of the other ingredients until it’s a little thinner than applesauce. Put the butter and half a spoonful or so of the minced garlic in the skillet on medium heat, melt it down and stir it around a little. Plop in about half of the potatoes in one layer in the skillet. Put down a bunch of salt and pepper, then put in the other half of the potatoes. More S&P on top. Pour milk and chicken stock over all that business, put the cover on it and let it sit on low-ish heat for 3 minutes. Rub a stick o’ butter around on the glass dish, and toss in all dem taters. Sprinkle the cheddar on top, and cut up some little cubes of butter and put them on, too. Bake it on up for 20-25 minutes at 425°. Asparagus, olive oil, salt, pepper, minced garlic. In a pan. Probably known by several names, this is another family classic. Open the explodey biscuits, cut each one in half. Pack them into a circular 8-inch pan (Teflon, if you’ve got one). Mix together everything else in a bowl or measuring cup and pour over the biscuits. Bake at 350° for 15-20 minutes. OPTIONAL: If you’re feeling brave, flip the pan over onto a plate or platter after it comes out of the oven. The biscuits should (usually) slip right out of the pan, and it makes for a nice presentation. 2 cups of beef stock (again with the stock stuff). Put the onions in the bottom of the pot. Place the roast on top, then dump in everything else. Pour water over the whole thing just until it covers the pork. Cook it on low heat for 4 hours. I’ve been having a bit of a tough time at work lately. It was my first few weeks of having my general work performance be reviewed, and I had a lot of criticism coming my way. A lot of times the only thing keeping me going was knowing that L would always be there for me when I got back. But that’s the thing about living your entire life alongside someone else. Marriage, it seems, isn’t about making everything perfect (despite our shared love of stylish clothes and minimalist interior decorating). Maybe marriage is more about keeping each other happy, healthy, and alive. And that’s what we’re learning to do for each other. In fact, she’s improving my mental well-being as I type, since she’s now trying on my giant thick glasses and making me laugh. Sometimes, something that simple is all it takes to get through rough patches together. Whew! It has been quite the week at in our apartment-spring break meets wedding planning week. We’ve conquered caterers, hair cuts, trips to the courthouse to obtain marriage licenses, water flowing into our apartment from the flooded unit upstairs, and a fantastic meeting with our photographer. Now that I have “rested” this week (haha), we are revving up for Easter and my return to school. My way of relaxing apparently is cooking, which I have done a lot this week. I baked banana muffins, made turkey chili, and am about to put a batch of sugar cookies in the oven (shaped like carrots, bunnies, and flowers, none the less). 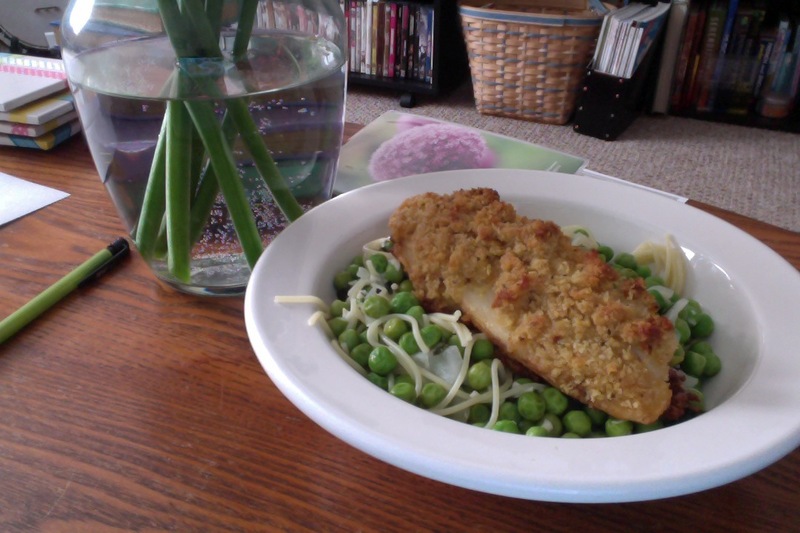 Lightly breaded fish and spaghetti with peas, lemon and mint- yum! 1. Set up three dishes: in one place flour, in one place egg (lightly whip), and in one place the breadcrumbs/cornmeal. Dunk fish in flour, egg, then breading. Season with salt and pepper. 2. In a skillet, heat olive oil. Place fish in and flip over when golden brown. Cook until fish is golden brown on both sides and the fish is flaky. 3. While fish is cooking, start water to boil for spaghetti in a big pot. Cook until al dente. 4. In a skillet, heat olive oil. Saute onion and garlic for 3-4 minutes, and then add the butter. 5. Toss in peas, and cook for another 3-4 minutes. 6. When peas are cooked, turn off heat and squeeze lemon juice over pasta, as well as toss in the mint (minced) and parmesan. 7. Toss pasta in with sauce and peas. 8. Serve each fillet over pasta and peas. Try not to have one space where all of your extra junk goes to die. We’re actually guilty of this at the moment, given that the office has become “wedding central” until we can organize where it’s all going to go- but kicking myself into getting organized has helped me breathe easier, once I can walk into any room and see floor space and clean surfaces. If you have limited counter space in the kitchen, keep it free of appliances. Even if it seems like a bit of a hassle to keep the toaster/coffee maker/QVC-purchased-object-that-almost-kind-of-works in the cabinets or on top of the fridge, a clutter-free counter gives the illusion of having much more space. Got a small-ish rug? Stick it partway out from under the couch or love seat. This will give the look of having increased floor space, so that other matching rugs or the coffee table seem to have a bit more room. Think vertical. A tall bookshelf or floor lamp (or this cool clock from IKEA) will draw the eyes upward a bit and create some depth to the living room. A few minutes of straightening up every day is way easier than spending an afternoon on it. Take ten minutes, right now, and see how many things you can get off the floor. Tomorrow, do the same thing with your kitchen table/counter, etc. Small amounts of work at a time can be just as efficient, and MUCH less stressful. Get yourself a bigger apartment. We’re planning to move pretty soon. Fear not, we’ll keep blogging! Alright, not the best pic, but it might be one of the best things I have made in a while. 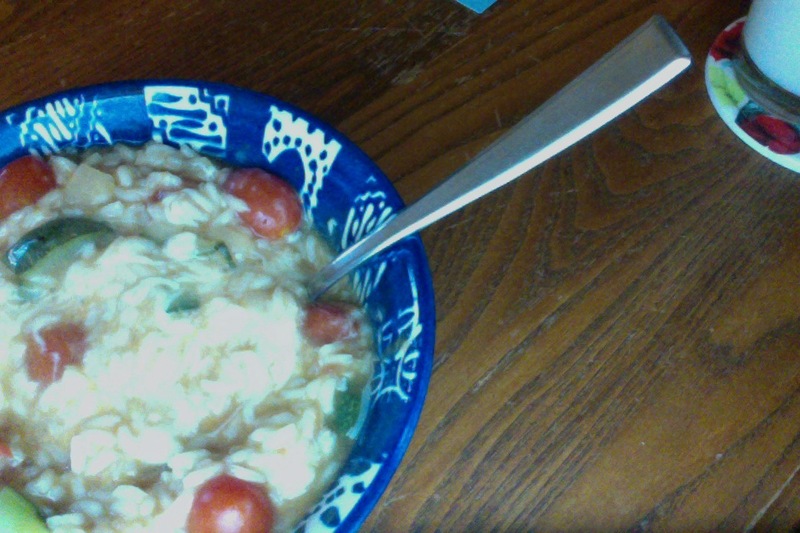 Clean Out the Refrigerator Risotto. 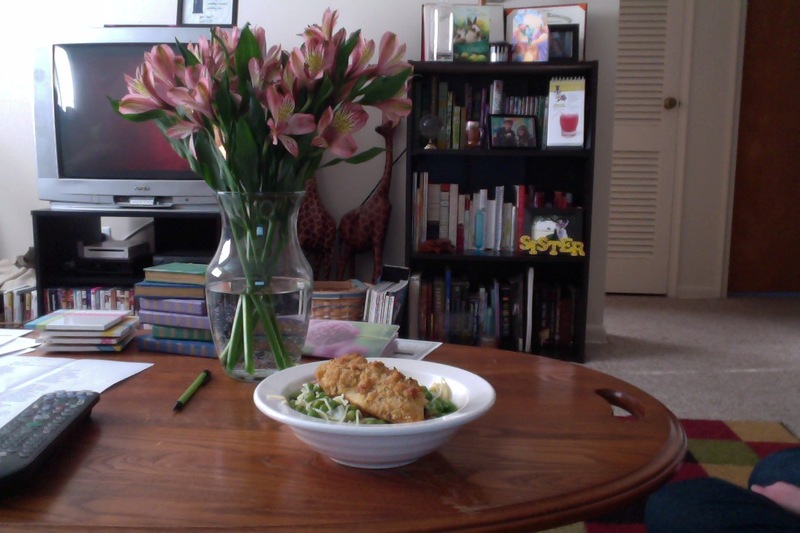 With all of the wedding planning we have been up to lately, J and I have been eating a lot of leftovers recently. I also seemed to over plan (shocking for those who know me), buying more than we needed for once. So, it was time to use up some food in the fridge. 2. Bring chicken stock to a simmer in a saucepan- take off heat when warmed through. 3. Add garlic, salt and pepper to onion. 4. Add zucchini and tomatoes and cook 3-4 minutes. 5. Add rice to vegetables.